Just Friends came out in December of 2005 and just barely flew under the radar. It is quite a shame, considering that this movie, more than any other, demonstrates the talent that Ryan Reynolds has at doing what he does best: being a complete jerk. Reynolds has always done his best when in the role of a smug, cocky, and crassly witty anti-hero and this time is no different. Chris Brander (Reynolds) was the fattest kid in high school whose best friend just so happened to be the hottest girl in school, Jamie Palamino (Amy Smart). When word gets out that he is in love with Jamie and wishes to be “something more,” he is immediately told by Jamie that he is “like a brother” to her and is instantly crushed and publically humiliated. Ten years go by and Chris is a changed man: he’s athletic, wealthy, confident, a womanizer, and popular with the stars of music and showbiz. Due to a twist of fate, he finds himself back in his hometown and facing Jamie once again. As the title implies, Just Friends is a unique comedy that tackles a situation that most men have been through: the 2-Ladder theory. The idea is that women have a tendency to put men on one of two inescapable relationship ladders: the friend ladder and the “something more” ladder. 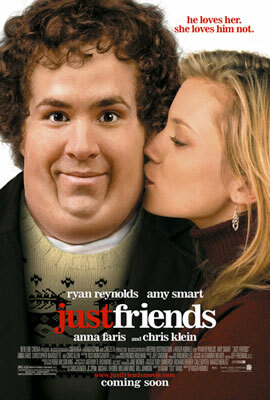 Or, as Chris calls it, “the Friend Zone.” As the fat Chris Brander, Ryan Reynolds shows us his acting versatility as he is able to convincingly don the role of the lovable fat kid who is smitten with his best friend but cannot muster the courage to adequately tell her how he feels. His weight problem and awkward social surroundings don’t make matters easier, either. He is immediately a character you identify with, not because he is a full-blown geek but because he is a person of good intentions whose inner self is not fairly represented on the outside. Of course, as the grown-up Chris Brander, Ryan Reynolds takes on his very typical role of the smug jerk who you either love or hate. Unlike his other movies, this one is rated PG-13 and so Reynolds is forced to tone down the crassness and pursue other means of humorous expression. This is where the movie truly gains and keeps momentum: the chemistry that the characters of the film have with one another is the only real “romance” in this so-called “romantic comedy.” Chris and his brother Mike (Chris Marquette) fight constantly but retain the mutal respect that you would expect between siblings: you are honestly convinced that they are brothers in real life, and the majority of the film’s funniest moments come from their interaction. Naturally, the movie would not be complete without the love-interest, Jamie (Amy Smart). Jamie is convingly attractive as the girl-next-door and has the charm and looks to be believable to the audience: her relationship with Chris is likewise just as convincing. The movie only slows down when it sacrifices plausibility for the sake of a happy ending. Chris is a jerk to Jamie initially, thinking that by playing the upper-hand that she would be swept off her feet. Instead, she’s disgusted by Chris’ actions and is immediately turned off… yet continues to agree to see him. The new guy, Dusty (Chris Klein) shows up just in time to be a convincing foil to Chris and there’s no reason not to think that Jamie would really like him… until you find out that he’s even more of a jerk than Chris is. Though the movie is a comedy and not a statement of how to handle being in “the Friend Zone,” you can’t help but be annoyed at times when the plot strays away from the expected in favor of a fairy tale resolution.